When I lived on London, every once in a while I would stop and think, "Holy crap, I love in London! This is awesome! I'm awesome!" I realised the other day that I haven't had a single moment like that in the nine months I've lived in Australia, despite Australia seeming to be so much more exotic and cool. I've had moments where I marvelled at the fact that I'm in a real relationship, with someone awesome, and I've marvelled at the soft sand beaches, but even in Melbourne, I don't feel like I've achieved something big by living here. But it's early days. I'm still recovering from the move and settling into this vibrant new city, finding my place in it. I'll get there. Anyway, I didn't have to work the Friday, Sunday, or Monday, so instead, I decided to get a urinary tract infection that traveled up to my right kidney! Woo hoo! I had no idea UTIs were so painful! Holy crap, I now feel suitably sorry for anyone who gets them frequently. Yeesh. Thank The Lord for antibiotics and painkillers. 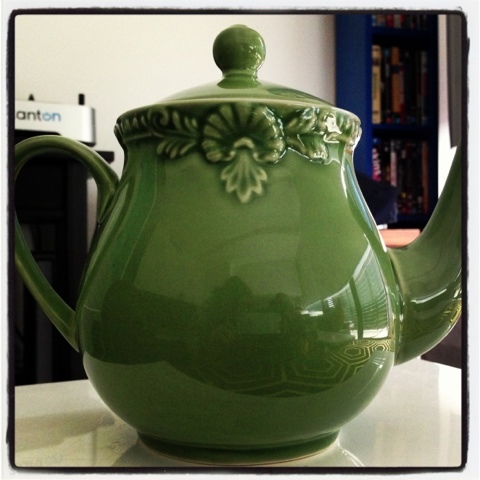 Photos: I wasn't too sick to buy a new teapot. Ain't it perdy? And pretty fabric for new tea towels. 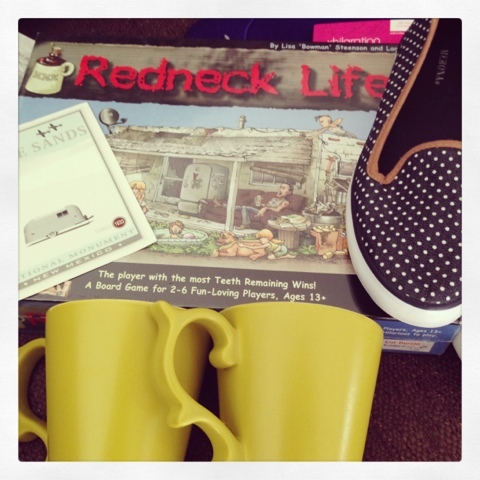 Jody and Amy sent me birthday presents! Yay, Redneck Life!! Unsolicited editor's comment: I think you need a transition sentence between your 'urinary tract infection' paragraph and your 'photos' paragraph... I was a little terrified for a moment! ;P Lol, anyways, I'm glad you are feeling better. And I second your Here Here for Antibiotics!!! Beijing would have killed me without them!!! Haha I'll keep that in mind for the future. 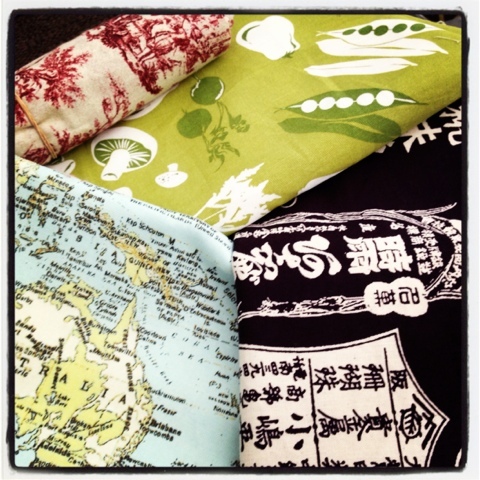 I LOVE that green veggie fabric! Where'd you get it? !